If you are a beer aficionado…this may just be your chance to quaff some of the finest brews around the country. The grounds of the Mount Hope Estate and Winery are the home of the 6th annual BrewFest. One admission price grants the attendee a host of goodies… forty-something breweries will be on hand to top off your sampling glass..you might just want to take notes on your favs, live entertainment from a number of bands and a variety of foods (from the looks of the menu, there will be something to please just about everyone). Dozens of vendors will offer a variety of merchandise, as well as official BrewFest gear. 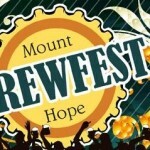 Each year BrewFest at Mount Hope helps support the community by offering raffle tickets for the Central PA Food Bank..great prizes are available. Note: No one under the age of 21 will be admitted..valid identification will be required.